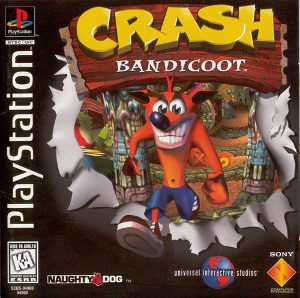 We have Crash Bandicoot, although it's been a while since I played anything on our old Playstation II. Oh man I was all about some Crash Bandicoot. I played all of them I think. I played the first one extensively, then bits and pieces of the other ones. Haven't played any of the recent ones though. Crash was going to be one of the big new franchises. But I guess that didn't exactly happen, or for too long, anyway. Yeah. It had its moment. I didn't play this one often, but I did love my Sony games. It was one of the first games I ever saw on PlayStation, so maybe that's why I played it as extensively as I did. I played it while I was a student. Loved it!